6.5 komi, 1 white prisoner. Black 17, White 12+1+6.5 = 19.5. This isn't exact, but it's enough to give us an idea that the game is pretty close, with white having perhaps a slight lead. Below are many methods for estimating the score before the game ends. Extend territories 'straight' to the board edge. The most obvious way to count is to simply look at what appears to be "territory-like" and count it up, counting two points for each stone that appears dead as it stands, and then one more point per capture. Of course, the trick is deciding what is and is not likely to stay dead or remain territory. The other main drawback of this method is speed -- it's about as slow as counting up a finished game. Peterius: Is brute force the best method? I looked over this page but it seems like in the end, you just have to count up all the points, there's no short cuts. Maybe doing it in chunks helps. What about keeping a running total for each player and changing it each move. Can any higher level players say they are really accurate about this or that one just gets better at seeing chunks of territory as accurate counts with time? Jeff: It's similar to when a child is learning numbers. At first: "How many apples are there? "1, 2, 3 -- 3 apples!" The child must count each individual point. You, however, can probably look at 5 apples and see them as five apples without counting. For 6 apples, you still probably don't count. In your mind, you split them into two groups of 3 and arrive at the conclusion: 6 apples. I can count thirteen pretty quickly, finding three groups of 4 and seeing one left over. Alternatively, without any counting, I can look at 13 apples and say it's about 12, give or take a few. Wdst20 I simply arrange sections into squares or rectangles. If there are some stones interferring with a big rectangle i take note of their position and location, then simply add them on at the end or subtract, however the game dictates. Another good technique is to compare territories directly. First, mentally pick up the captured stones from the lids of the bowls and place them inside your opponent's territory. The idea is to use the captures to neutralize a territory of roughly the same size, so you won't need to count it manually. Next, do the same for the dead stones on the board. Finally, compare the territories by sight: "White's upper left is about the same as Black's lower left, White's center is about 10 points smaller than Black's right" and so forth. This method is very fast and can give quite accurate results, especially with some practice. This is a lot of description, but the actual mental calculation is very quick, especially at a physical board. You can often save time by counting in two's instead of each point individually. This way you count pairs of territory, or one dead stone inside territory as 'one, two' etc. Visualising pairs of points is normally quite easy. Timm(5k): I've tried this method and I like it because it's fast and very practical for dead stones. However it is painful to keep track of the ½ points stemming from territories with odd values, and it is more difficult to visualize the yose when counting by two — this includes estimating the territory value of groups with small life. Overall I think this method encourages inaccuracy and I am not sure it is recommendable. This may sound tricky, but if you wasted numerous hours you should have been studying by playing some form of pentomino, this can actually come quite naturally if you think of filling the inside of territory with "blocks" and can be very fast. Just be careful how you count up dead stones. If you have the memory for it, you can save time by counting and remembering each territory individually, not just the overall score. This way, next time you count, you only have to recount those territories which have changed. This was recommended by Steve Fawthrop on rec.games.go some time ago. (This method cannot be used if you have remembered all the individual territories). After counting your opponent's territory, don't remember the actual value, but the next large number up. (E.g., for a count of 73, remember 100). Start to count your own territory not on 0 , but on (large number - actual count) - in the example above, start counting on 27. This way, you only have to remember 100, and compare the count of your territory with 100, not with the actual score (which you've forgotten). 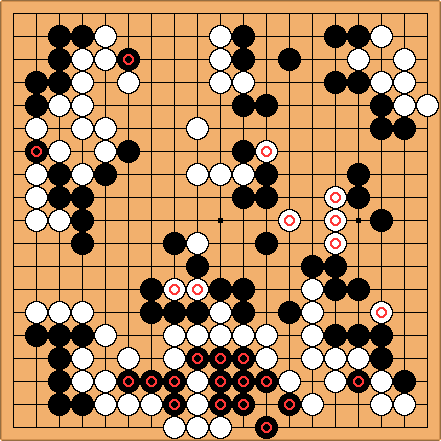 Andrew Grant: A variant of this which I was taught many years ago is: Count your territory, then count your opponent's territory backwards starting from whatever total you reached. If you run out of opponent territory before you reach zero, you're winning, and the number you finish on tells you how far ahead you are. Don't forget to adjust this for komi. When you first start counting, the borders of the territories are not very well defined and are subject to change. As a first assumption, you can extend the territories straight to the edge in a 'neutral' manner. Normally there is very little territory in the centre. Unless this territory is really well defined (I.e. completely certain), do not include it in your count. Often the result of a count is that someone is behind and one way of looking at it is that means that I have to gain 15 points in the centre or that means he must gain 15 points in the centre - I can relax a little and play solid moves. A refinement of the Comparative Method is to use area scoring. Instead of counting both black and white territory, it is possible to count just one of them, using area counting. Especially in online games this is convenient, since you have to know the number of moves already played. Select the color which looks easiest to count. Count the empty intersections, dead opponent stones and include not yet played border stones of the selected color (normally you do not count the latter, but only the expected empty points). 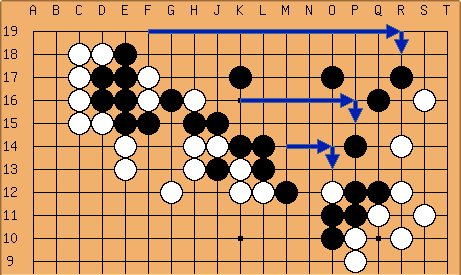 Dead opponent stones count for only one point in this method. Add the number of board moves played/2 (round up for black, down for white). When counting for black, add the number of handicap stones minus one. Subtract this when counting for white. Subtract the total board intersection/2. Multiply this result by 2.
aLegendWai: It is good since it may save half of the time to count ^^ (so it is called half counting). But I'm afraid if it is not that applicable to games in early/middle state. It is because it seems it gets problems when there're neutral points and uncertain territories on the board. aLegendWai: I don't think my comment applies to all methods. If I get it right, the problems of this method are the existence of neutral points and uncertain territories. How to count if there're neutral points? It mention nothing in the calculation as far as I know. I think I need to decide which territories is which before I can use the half counting. In other methods, I will simply mark some territories as uncertain and exclude from the estimation. I this method, I think I can't do the same. This method seems based on an assumption that it is opponent's territory if it is not yours. But neutral points and uncertain territories have to be figured out before reaching the estimation of territories on both parties. If I can't figure out these 2 problems, I won't get the answer. You can try to adjust lines to the inner territory to make squares in the same way as you adjust lines to approximate in a mathematical diagram. Since the inner edge is often somewhat smoother this works pretty well. In the UL white has some 15 points if you count the empty intersections. By approximating the area with the marked stones you get three times six and and by subtracting one for the white stone you get 17 points. In the LR you can count the empty intersections and you will get 26 points. By approximating it with the marked stone and the marked intersection you get four times seven and by subtracting one for the black stone you end up at 27. You can also try calculating points in terms of rectangles, to make use of quick multiplication. The free TANGO go client software has a very nice function which uses GNUGO's score estimating function to form a progress chart. The chart gives an estimate of the score as the game progresses. It is a wonderful post game analysis tool. Simply import an .sgf file; index the game to the second to last move; and engage the progress chart function. After about 10 min, a chart is formed giving the score vs. the move. Come to think about it, this may be a great way to train on counting. Simply move a game to a position, try to estimate the score, then check the chart. Gernotti: Same is true for The Many Faces of Go V11 ( http://www.smart-games.com/manyfaces.html). I agree with crux's objections in principle, but it can give you a rough idea, where in the game something really went wrong. crux: Of course, that assumes that the computer knows what it is doing. I'd hesitate to recommend this kind of thing; computers don't really understand the game. Beginners could easily pick up wrong ideas this way. wad: It seems that a tool to practice counting would be useful. A series of board positions for the reader to count the score on, with a "click to see the actual count" link, for example. Anyone seen something like this? I know I need the practice. xela: There's something similar to this on Steve Fawthrop's site under the heading "counting lessons". ilan: There is another counting method, which I would venture to guess is the one used by professionals: Have so much experience counting when there are typical formations, that you instantly know, up to very small error, what the correct estimate is. If you don't believe me, spend 5 years adding short sequences of numbers totalling less than 200 (with strong restrictions on the summands), and you will find out how good one can get at estimating the sum at a glance. This could be verified as follows: test professional for speed in estimating the score for typical positions that come up in play, and then do the same with strange positions that never come up. As far as I know, nothing in the rules prevents you from writing down the score on a piece of paper. As a mathematician, I try not to waste my limited brain power on doing trivial (having no independent interest) calculations in my head -- I try to save whatever brain energy I have for the hard stuff. In this sense, writing down the score is more consistent with productive thinking habits. Mef: My understanding is that most tournaments allow you to take whatever written notes you want to during the game, but your opponent must be able to see them if requested. DrStraw: I have to disagree with this. Where do you draw the line? It is acceptable to write down possible joseki which fit the situation on a piece of paper so that you have to think about it again 20 moves later when you return to that corner? Most would say no. No external aids should be used. DnF: The EGF Tournament rules state in Section 2b: During play the players are not allowed to study the game on another board. Nor is examination allowed of go-literature or game-technical notes. And then: Usage of the score sheet is allowed. The same applies to personal notes insofar they have been made during the game and do not contain diagrams with which to analyze the game. Andrew Grant: To say that there's nothing in the rules to prevent this is to miss the point. It's necessary to distinguish between rules, which only specify how to play a legal game, and conditions of play which are specific to tournaments and are decided by the individual tournament organiser. "Conditions of play" specify such matters as time limits, time control systems and players' behaviour. If a tournament organiser states beforehand that no external aids should be used, then that's that. Personally I'm with DrStraw on this one. If you need paper and pen as a crutch to augment your thinking, shame on you. 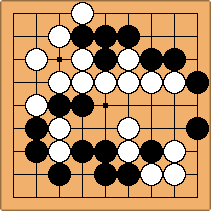 Go is a contest of minds alone, or it is nothing. There's nothing in the rules to prevent you getting advice from a kibitzing 6 dan, but would anyone really say that was fair? "During the game or a recess the players are not allowed to ask others for advice. Hints, warnings or remarks by third parties must be rejected definitely by the players; under no circumstances are the players allowed to involve themselves in a discussion of their game." Section 2e highlights that it is against the rules for observers to influence the game, for example by commenting so that the players can hear, except by bringing a breach of the rules to the attention of the referee (and not the players). Personally, I think that making notes on the game isn't that bad. I wouldn't do it myself, but I wouldn't be particularly offended if my opponent did it. Section 2b of the EGF Tournament rules does, however, seem to prohibit it. 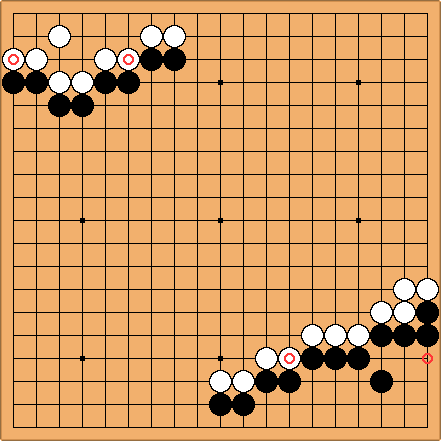 I'm not sure that I agree that Go is a pure contest of minds without a crutch, though. I, for one, would find playing without a board quite tricky! I would just like to point out that in an episode of Hikaru No Go, one of the characters openly refers to a book on joseki whilst playing a tournament game. It may not be good etiquette but neither his opponent nor anyone else present seems to mind. I don't know if this is common but it seems acceptable, at least at that level of tournament. I think that if this is acceptable then jotting down an estimate of the score during a game is totally permissible. Anon: I was about to leave this page after having thought I had gleaned as much as interested me from it but then I saw the header at the bottom about writing down the score. After reading everything you wrote, I'm surprised no one has said (if they've realized it) that you can use paper as an aid to get quicker at counting and then start using it less and less until, as someone said in a earlier post, "you have a lot of experience" counting and it's not necessary anymore. Then (similar to what Dr Straw in fact suggested regarding life and death study) counting will naturally be a lot easier from seeing the general shapes around the points which you count as territory. Anyway that's all I wanted to add (and what I think I will try). If it bruises too many egos to see someone writing notes while playing then maybe this isn't the right game for them. A European amateur tournament was honored by a visit from a professional from Asia. While two top amateurs were in the middle of a difficult game the pro walked in and glanced at the board. "What's the current score? ", a kyu player asked him. "White wins by 2 points", the pro answered. "How can you possibly count so quick?" the kyu asked in wonder. The pro explained: "I look at the board and ask myself: What color would I choose to play with? I'd choose white. Then I ask myself: What color would I choose if black has 1 bonus point? Still white. What to choose if black has 2 bonus points? Still white. And with 3? I would choose black." Sandra: But how did he get to be a pro without ever going through a phase of counting in the first place? Or can you become dan without ever counting? MrTenuki: Maybe I'm nitpicking here... but assuming that the game was played with komi, shouldn't the estimate be W+2.5? After all, if White's lead were exactly two points, wouldn't the pro be indifferent between choosing Black and choosing White? Payne: I think that end score is possible to count as any fraction. 1/4 of point or even less is possible to count in.